Let’s begin with an apology. Because while I, like any intelligent marketer, am intrigued by the psychology of those consumers who outnumber baby boomers, who will live decades longer than them, but who right now don’t have as much cash as them, I was daunted by some of the things that the authors laid out in the introduction to this book. Not about twentysomethings; about themselves. First, “Twentysomething” grew out of a successful piece in The New York Times Magazine that Ms. Marantz Henig wrote called “What is it about Twentysomethings”. The problem? It has been my experience that book contracts executed by publishers in desperate attempts to capitalize on a popular magazine piece, often result in heavily padded, maddeningly redundant and generally overinflated books. In other words, regurgitated magazine pieces that have been stretched out to book length. But lastly, I was fairly confident that the book was going to be a disaster when the authors explained that they were, in fact, mother and daughter, one a boomer, one a millennial, both journalists, who attended the same college, and who both worked, in some form, for the same company. Oh boy, I thought, a magazine article about how stupid millennials are, padded out by the piggybacking of the author’s daughter. But “Twentysomething” is none of that. “Twentysomething” is actually quite brilliant. Consistently, surprisingly, insightfully, brilliant. So I apologize to both Ms. Henigs for my qualms, fears and concerns, and attempt to make restitution by telling you to go out and buy this book right away. “Twentysomething” isn’t simply an investigation into the current crop of college graduates; it asks a much smarter question than that, namely, “Is the behavior we’re seeing in Millennials unique to them or is it simply the behavior of twentysomethings historically – and indeed, were the same things said of baby boomers when they were in their twenties?” This premise the authors explore across seven elements, ranging from schooling to love to friendship and beyond, and, pulling research from both contemporary and historical sources, compare and contrast the challenges, phobias and actions of twenty-somethings from a variety of eras. And what do they discover? Precisely what you would expect from a nuanced, thorough and substantive analysis: a mixed bag. That yes, millennials are unique, facing challenges unthinkable to previous generations. But also that there are fundamental issues that face every generation in what Jeffery Arnett calls their “emerging adulthood”. It is possible, however, that you’ve read this far and said, “Yes, yes, but at the end of the day, who cares?” So permit me to pivot from explaining why this particular book on twentysomethings is important (and it is), to explaining why ANY intelligent book that serves to decode and understand millennials is valuable. Now, I do not think I am going too far out on a limb when I say that the economy of the United States has been – not solely but certainly dominantly – the driving engine of the world economy since the end of World War Two. And again, I don’t think I’m breaking any radical ground by saying that consumerism, or some form of consumer culture, has driven the U.S. economy during that time. Even lo these many years after the start of the Great Recession, consumer spending is still responsible for around 70% of GDP. And what has driven consumer culture in the United States? In the 50s, dollars went toward making sure that babies, then toddlers, then kids, were happy. In the 60s, it was the mollification of teenagers. In the 70s, young college graduates, and so on, all the way up to this very moment. In other words, U.S. consumer culture since World War II has been driven by the appeasement of baby boomers. Again, not rocket science. Except that around 2020, Baby Boomers (if current longevity projections are accurate), will start dying off. Which means the driving force of the world economy for the past 60 years will, by definition, shift. And the generation poised to replace them – or not – as the dominant cultural and economic force in this nation? That’s right, today’s twentysomethings – who by then will be closer to thirtysomethings. You, of course, are free to ignore them, denigrate them, or tell them to get the hell off your lawn. Me, I’d like to understand them. And “Twentysomething” is one very good step towards that. 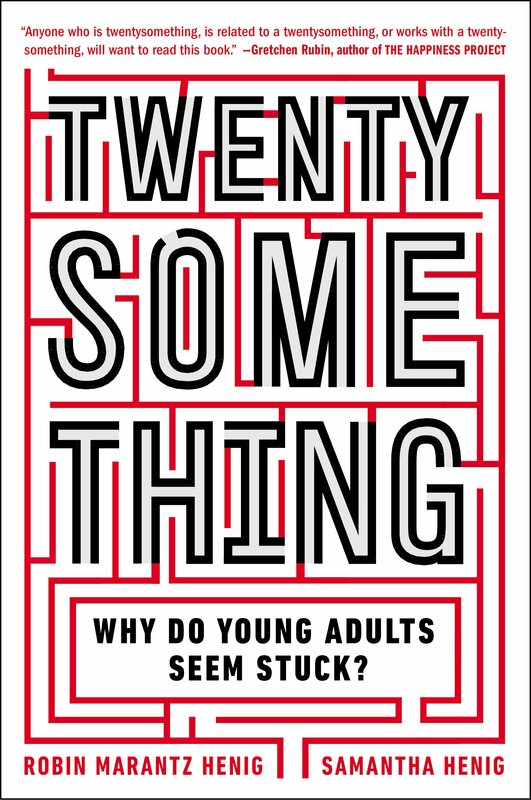 Twentysomething: Why Do Young Adults Seem Stuck by Robin Marantz Henig & Samantha Henig was published by Plume on 11/08/12 – order it from Amazon here – or from Barnes & Noble here, or pick it up at your local bookseller (find one here).